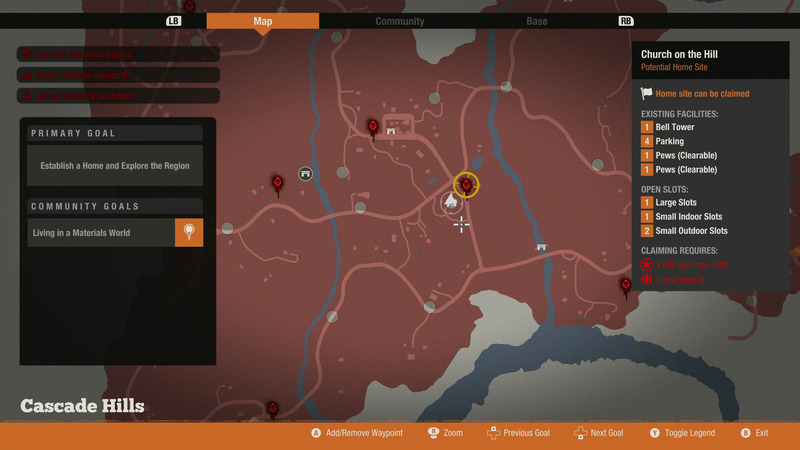 Find the base that suits your community’s needs in State of Decay 2. 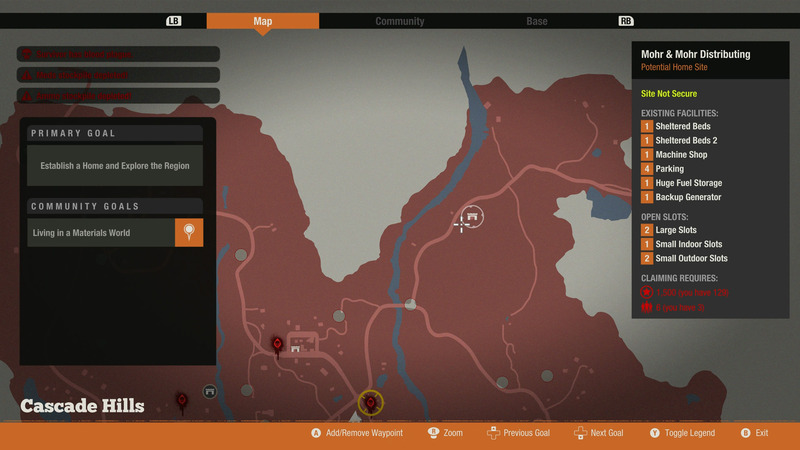 Choosing the right base in State of Decay 2 requires careful planning and resource management, and is a task made easier by knowing about all the bases in a given area. 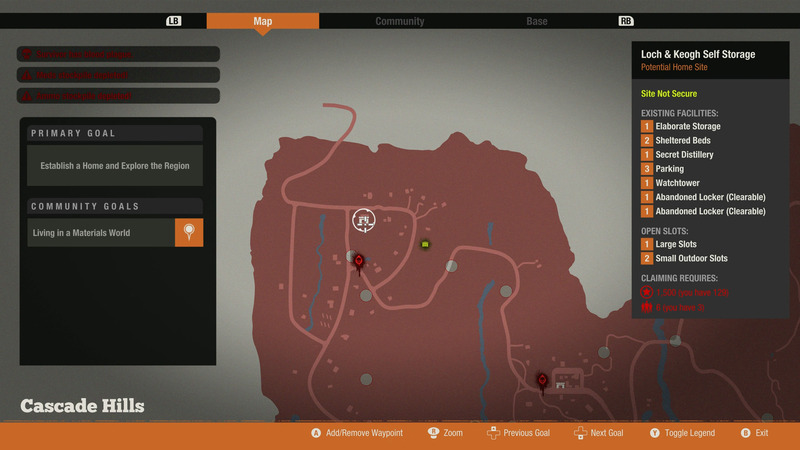 There are currently three maps that players can survive on, and those are: Drucker County, Cascade Hills, and Meagher Valley. 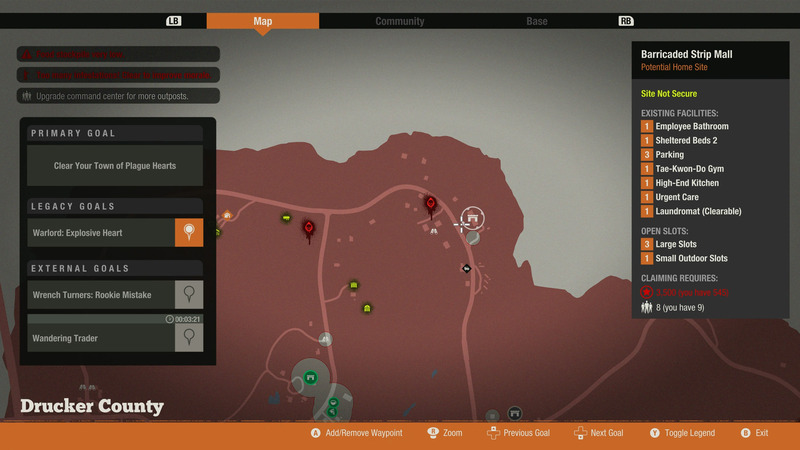 Each of these maps hold several bases, and finding the best one is essential for surviving the undead horde. Drucker County is a large area full of fields, rocky plateaus, and several areas containing densely clustered buildings. Spread out around this region are six optional bases with a seventh base that is required as part of the story. 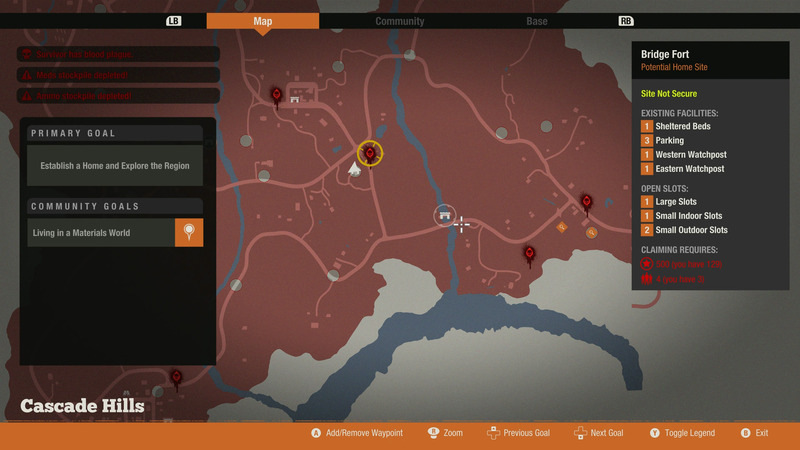 Each of these bases sit at one of the main points of the map, though choosing a base at the edge will mean a greater distance must be travelled to collect resources or help other enclaves. Out of all the available bases in the area, the best base in Drucker County is arguably the Barricaded Strip Mall. Though it might not have the best location, it does boast the most facility slots, which will make the community's life easier as the game progresses. Before a new base can be claimed, all the rooms and areas must be entered, and then all the zombies must be killed. 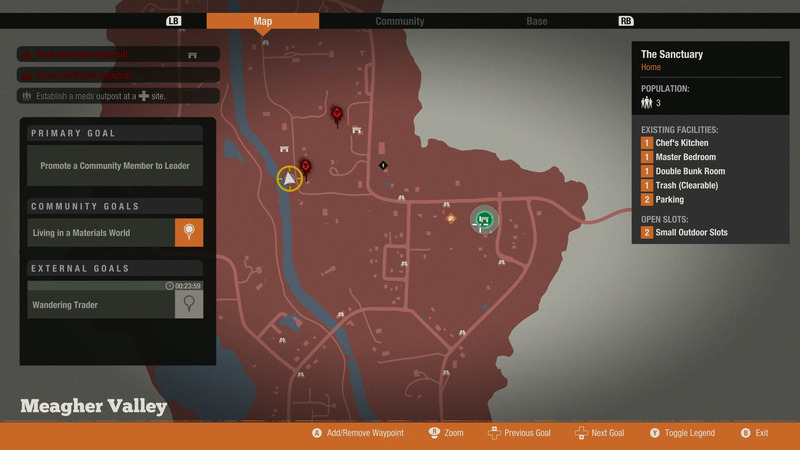 A counter will appear at the top of the screen displaying the amount of rooms that must be checked and how many have been cleared. 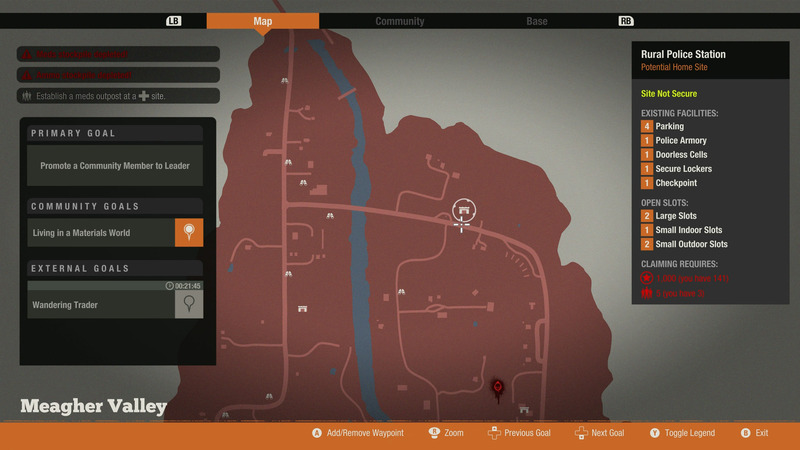 This is the very first base available in Drucker County, and is found in the middle of the map. It’s the basic base available at all locations, offering only three small slots for additional base building. The only way to supplement this base is to claim outposts to replace the function of certain facilities like farms and latrines. The Barricaded Strip Mall is found in the north area of Drucker County and is one of the more expensive bases in the entire area, requiring a massive 3,500 influence and eight survivors to unlock. However, this high price brings with it a lot of existing facilities and available slots. 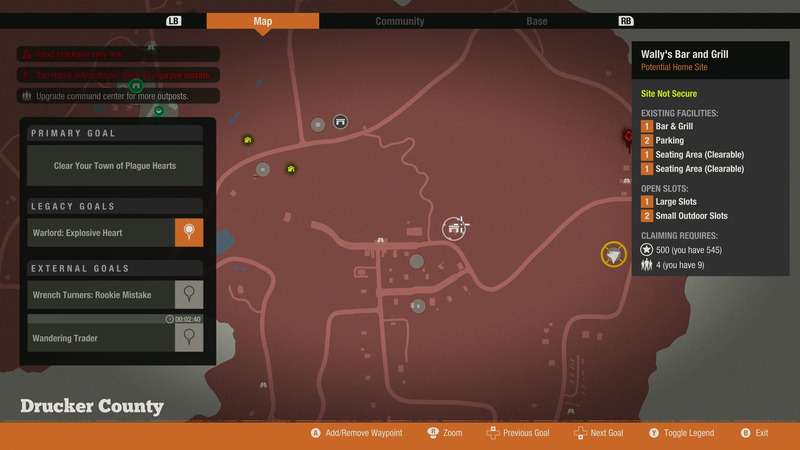 Make sure you know how to earn more influence points to help you unlock this base faster. 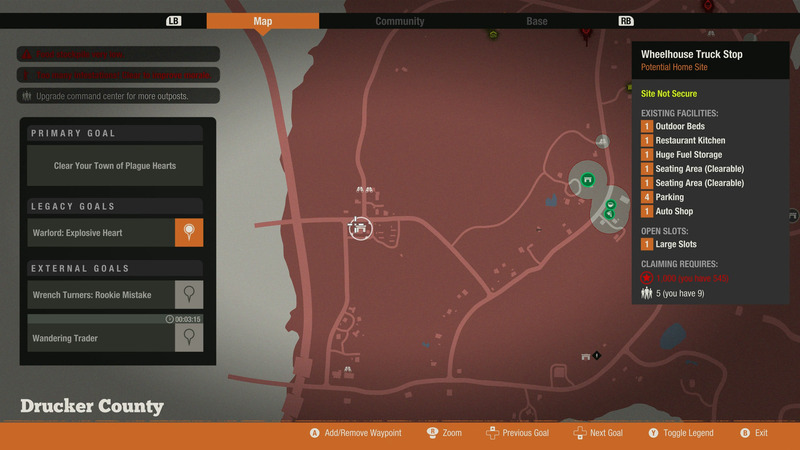 The Wheelhouse Truck Stop is located on the western side of Drucker County and will set players back 1,000 influence and requires five survivors. Due to the cheap price of the Wheelhouse Truck Stop, don’t expect a lot of available building slots. Another base can be built in Mike’s Concrete, a building in the west of Drucker County. This site offers a couple of large outdoor slots as well as a few sheltered beds. 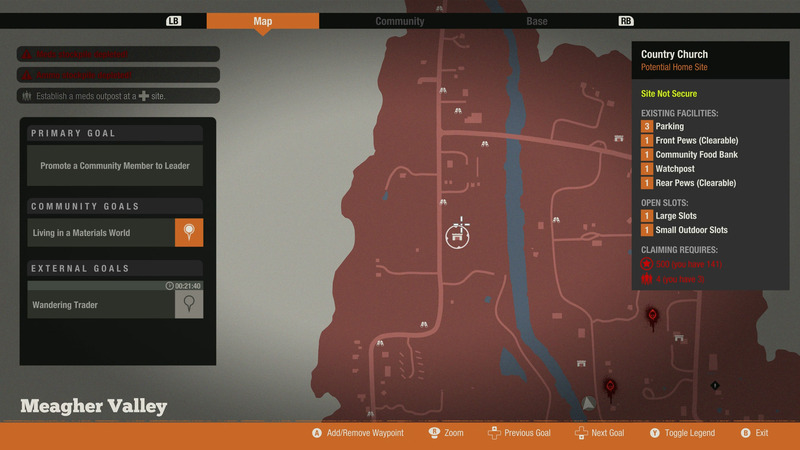 Given that the base is located on the edge of the map makes it easier to access main roads. Claiming this base requires 1,500 influence and six survivors. Another base can be located in the deep south of Drucker County. The Cabin Park Motel is a reasonably priced (1,000 influence and five survivors) base that offers a small step-up in space from the starting community. Including the clearable areas, the Cabin Park Motel offers five slots for facilities to be built, which should come in handy when trying to improve community morale. 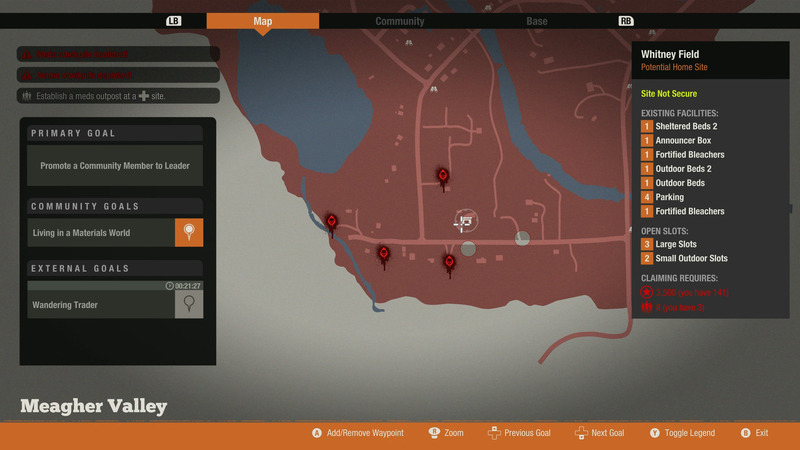 Wally’s Bar and Grill is another base in Drucker County that is located in the middle-east area of the map. 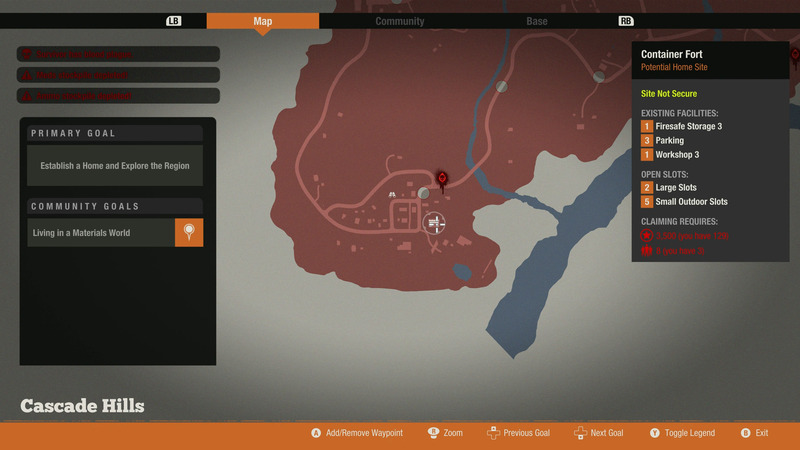 This is situated next to a main road and a dirt road, and given its central location, makes it easy to reach other areas of the map. This base is also exceptionally cheap to acquire, costing only 500 influence and four survivors. However, because of its cheap cost, it doesn’t have the best slots or existing facilities such as sheltered beds, meaning beds must be built as an out-of-pocket expense. Knight’s Family Drive-In is located on the very eastern side of Drucker County and offers its own kind of fortified walls. This potential base site has ample parking with a primary focus on smaller slot sizes. Claiming the drive-in as the base will cost 1,000 influence and requires six survivors, but it’s worth it for the verticality of the area. 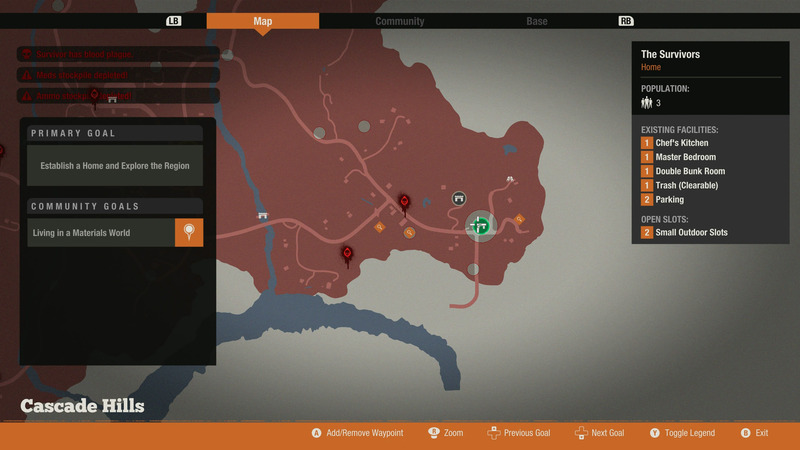 Cascade Hills is the most mountainous region in State of Decay 2, and all of the bases are fairly spread out, with the exception being the three planted right around the middle. As for the best base in the area, that award goes to the Container Fort with its high-level facilities and its large quantity of available slots. The Justineau House is the first, and free, base players will receive upon entering Cascade Hills. This has the exact same setup as every other starter base, but for the uninitiated, it has three small outdoor slots for facilities to be built. Bridge Fort is likely to be the next base that is found, as it is on the southern bridge that crosses the eastern river in the heart of Cascade Hills. With only 500 influence and four survivors needed to claim it, Bridge Fort is a decent early-game acquisition. Church on the Hill is located in the middle of Cascade Hills, to the left of the eastern river. A slight step-up in cost from Bridge Fort, Church on the Hill requires 1,000 influence and five survivors, though it does offer an elevated position and quite a few facility slots. Container Fort, as mentioned in the Cascade Hills introduction above, is likely going to be the prime real estate in the area. This contains the best pre-installed facilities as well as several slots for base upgrades. The only downsides to the Container Fort are the costs and the lack of beds. Claiming this base requires 3,500 influence and eight survivors. Loch and Keogh Self Storage is found in the northwest area of Cascade Hills and offers quite a few built-in facilities. There are also a few rooms in the base that can be cleared out for better expansions. Claiming this base requires 1,500 influence and six survivors. The Corner Office is one of the three bases located in the middle of Cascade Hills. To find this base, head between the two rivers and strike out north. 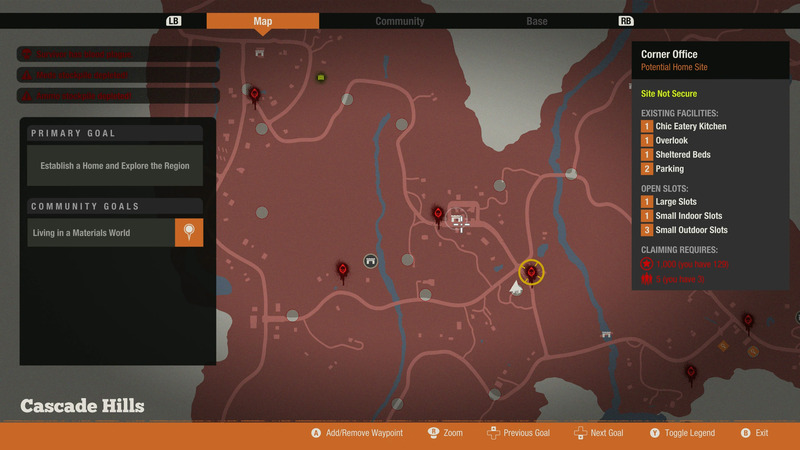 Being in the center of the map has its benefits as it allows for easy access to all areas of the map without requiring too much fuel consumption. To unlock the Corner Office base, players will need 1,000 influence and five survivors. Mohr and Mohr Distributing is an outlier in the collection of bases in Cascade Hills as it cannot be found by climbing a survey tower. 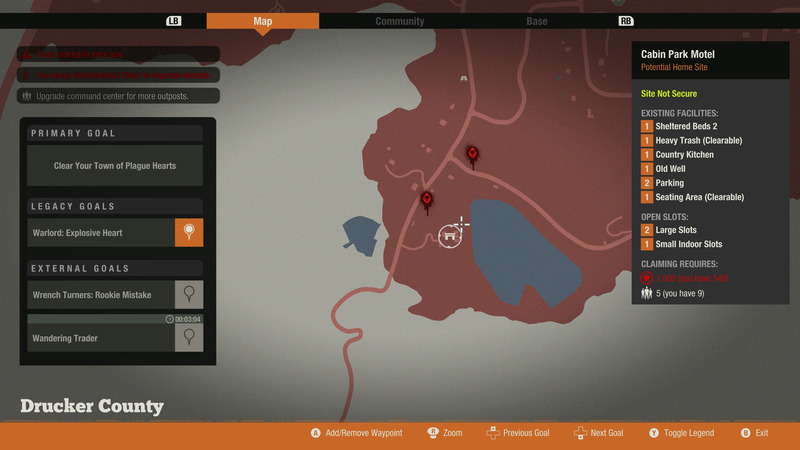 To find this base, players will need to manually drive to the northeast of the map and look out for the base on the right-hand side of the road. Despite its remote location, the Mohr and Mohr Distributing base boasts a few choice facilities and expansion slots, and for the low price of 1,500 influence and six survivors. Meagher Valley is a fairly open area, full of fields and wind turbines. Most buildings appear to still be intact, and there is little military presence felt around the area. 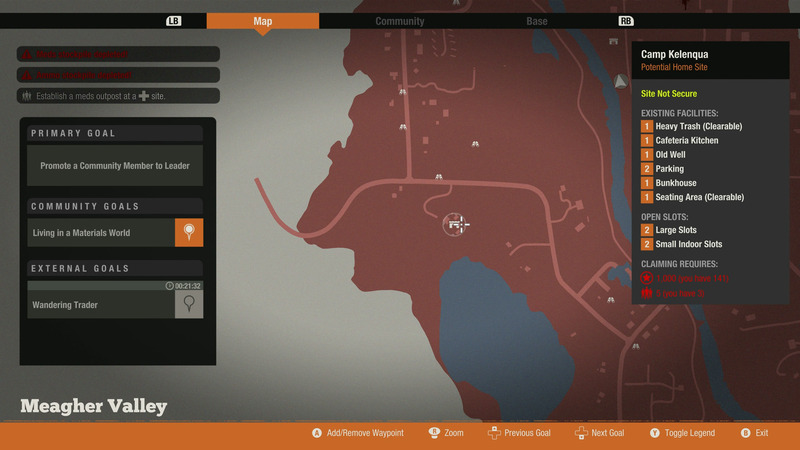 This is also the easiest map to navigate, given the fairly straight roads that tend to cut across the map nicely. Out of all the available bases, the best base in Meagher Valley would have to be Whitney Field located to the south. This offers the most beds as well as several slots for facilities. Much like Vogel and Justineau house, Clarington house is the first free base that can be claimed upon reaching Meagher Valley. This is likely going to be a short pit-stop for the community before requiring a serious upgrade in space. Mazzara Farm is located in the center of Meager Valley, on the eastern bank of the main river. This reasonably-priced base offers several facility slots, though like most of the other bases on this map, lacks pre-built bedding. 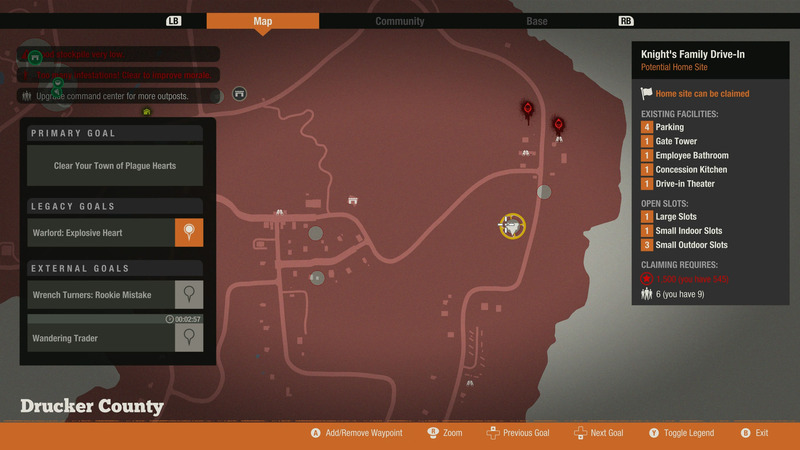 Claiming Mazzara Farm as a base requires 1,000 influence and five survivors. Squelones Brewing Company is nestled in the middle of Meagher Valley, right near the L-bend of the map’s northern limits. Costing a tidy 1,500 influence and requiring six survivors, this base offers several facility slots as well as a water tank, an excellent addition to any base. This is going to be a good choice for a community that wants to leave Clarington House as soon as possible, especially given its close proximity to the starter base. 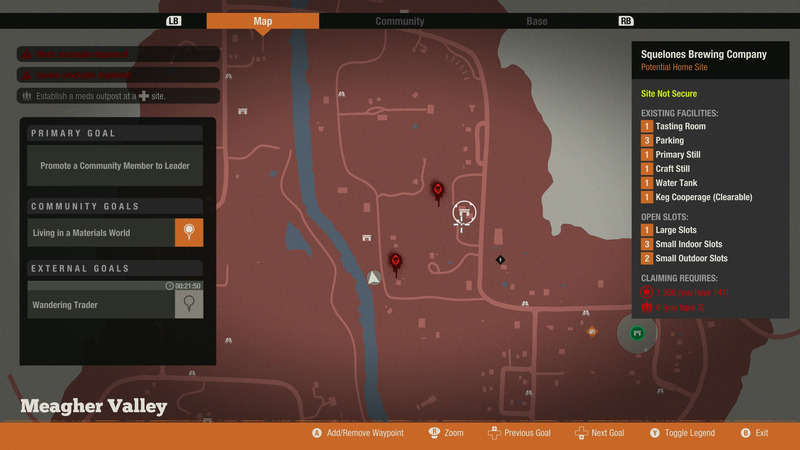 Found to the north of the map, the Rural Police Station costs the same as a few of the other bases in Meagher Valley, but it offers more weapon-specific facilities. Any community that wants to relocate here will require 1,000 influence and five survivors to make this base their home. The Country Church is located in the northwest area of Meagher Valley, along the main road leading to the tip of the region. This base costs a measly 500 influence and requires four survivors. Because of the low cost, the Country Church lacks some basic facilities such as beds, however it does have a few clearable rooms. 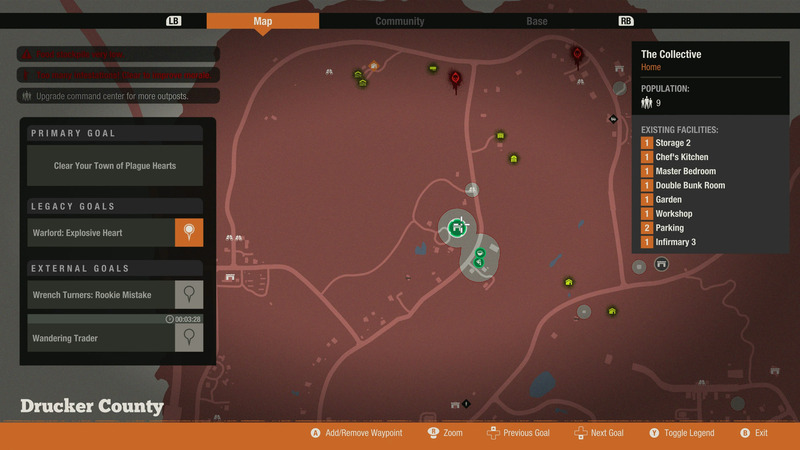 Located in the west of Meagher Valley, Camp Kelenqua is a decent early-game base offering several slots of facilities. The downside of this relatively cheap base is that it has zero sheltered beds, meaning the free slots must be dedicated to areas for the survivors to sleep. Claiming Camp Kelenqua requires 1,000 influence and five survivors. As mentioned in the Meagher Valley introduction, Whitney Field is arguably the best base in the area, and its cost reflects this. Any community that wants to make Whitney Field their home will need 3,500 influence and eight survivors. The advantages of Whitney Field are in its several sheltered beds that come pre-installed and its five facility slots. 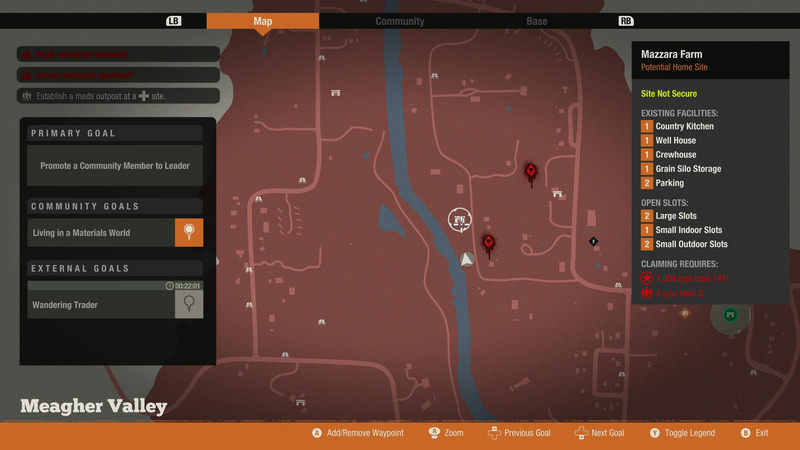 There are quite a few potential bases scattered around the three maps in State of Decay 2, and all of them offer excellent options for expansion. Picking the right base comes down to personal preference, though the more expensive a base is, the better it will be for the long-term. 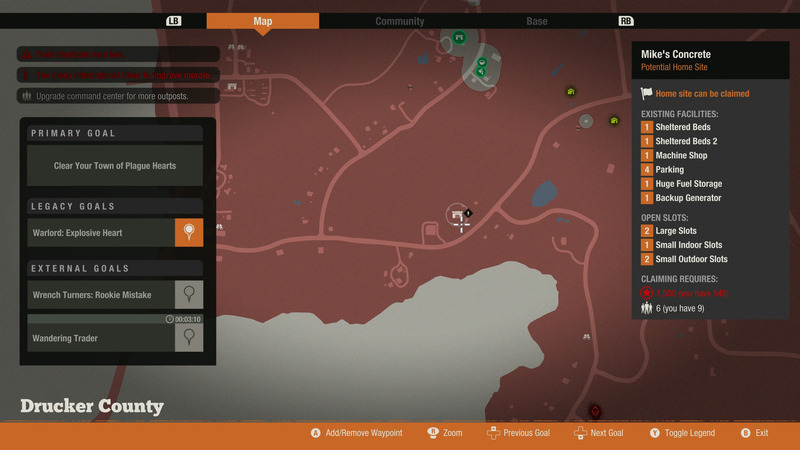 Aside from building the base and helping survivors, it’s important to know how to destroy plague hearts so that State of Decay 2’s “win state” can be achieved.